The Notekillers are one of the more interesting and unique stories in music, an history that we outlined when we recorded the band nearly two years ago at a benefit for Jonathan Toubin. The Notekillers have not played an NYC show since that night in 2012, but the band came together for another special night on Thursday. The space at 915 Wyckoff has been dormant since the Summer of 2011 when the Silent Barn was closed. In the interim, the building has been brought up to code and ToddP has now opened the new fully legal venue Trans Pecos on the site. Thursday was the debut show for the venue and we were fortunate to be there and get a good look at the place. The venue will continue to evolve in terms of physical layout and site upgrades (including outdoor patio) and the music and entertainment aspect will be produced by a series of excellent curators. The fine Brooklyn boutique label Northern Spy Records will curate every Thursday and their first event was a eclectic mix of genres. The Notekillers set was forty minutes of their proficient instrumental avant punk/prog/jazz and it was engaging from start to finish. From up close, it was a treat to watch a musician of such accomplishment as David First, but the band is truly a trio of equals as bassist Stephen Bilenky and drummer/saxophonist Barry Halkin certainly held their own. The band played songs from both their 77-81 Compilation and their 2011 comeback album We’re Here To Help, including “Eyelash” that we are streaming below. I recorded this set with the Sennheiser cardioids mounted on-stage in the middle of the three performers, and mixed with a slight bit of soundboard feed as enhancement and volume for the sax. The mix is primarily the onstage mics, which captured the sound superbly. Enjoy! 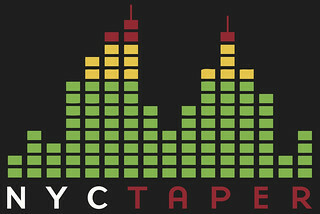 If you download this recording from NYCTaper, we expect that you will PLEASE SUPPORT The Notekillers, visit their website, and purchase their official releaes from The Ecstatic Peace Records website [HERE] and the Prophase Music website [HERE].